I contend many Christians can relate to the biblical account of the two men on the road to Emmaus. These men were disappointed in the outcome of what they were expecting to happen through their involvement with the person whom they believed was The Christ. They had put their entire life into following this prophet from Nazareth. These men were a part of a group that earnestly expected Jesus to lead a revolt that would overthrow the Romans and then become King over all Israel. I can only partly imagine how very disappointed and sad they must have been as they walked away from Jerusalem on that dreadful and eventful day when Jesus of Nazareth was beaten, tortured and crucified on the cross. When others had stopped following Jesus because His sayings were too hard, these very men who were now on the road to Emmaus remained faithful, and committed to Him right to the very end. What a deep sense of depression and great loss they must have felt as they helplessly watched and witnessed the cruel death of their hope upon that cross on the hill called Golgotha. They all scattered for fear of the Jews when Jesus was crucified. What sleepless nights they must have experienced following the crucifixion and burial of the man who had plainly demonstrated the Father God to them through His words and actions. They must have agonized over the fact that they had put so much time into this Messiah only to see their hopes slip through their hands like dry sand. They had left all behind to follow this man who said He was the Messiah the Son of the living God. As we endeavor to relate to these men, we read about them walking away from everything they had invested their lives in. These men were definitely grieving the loss of what they had expected to be the saving of Israel. For some the hopes of high positions of authority loomed in the background of their inner thoughts. Others had argued openly about who would be the greatest and who would be the least in the promised kingdom that the Messiah would establish on earth. A few days before, their hero, Jesus of Nazareth had girded himself with a towel and washed the feet of His disciples to illustrate the humble attitude of service they should have towards one to another. Now it seems all their hopes were dashed and their dreams lost! 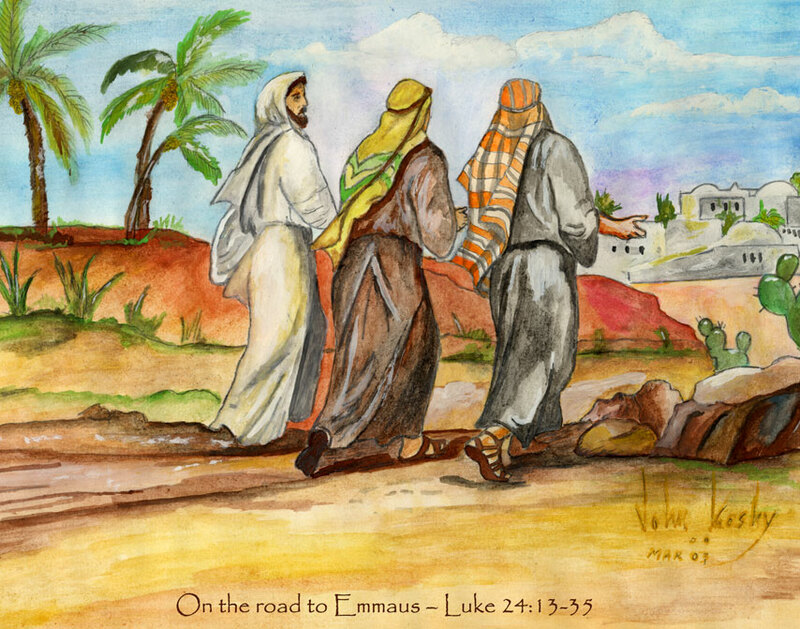 All this must have seemed so small and distant to them as they walked the dusty road towards Emmaus. While they slowly walked the distance, they were talking with one another about what had recently transpired in Jerusalem leaving them hopelessly sad. He allowed them to tell all that was in their heart concerning what had just transpired in Jerusalem. After listening to them bare their broken hearts, He began to open up the scriptures to them concerning Him. When He finally revealed Himself to them the outcome was magnificent! They were no longer disappointed, downcast or in despair, but were instantly elated and filled with enthusiasm. They ran back to Jerusalem to tell the others what had transpired. Is Jesus Christ now and forever both fully man and fully God? Our relationship with Christ must be “AS HE IS” today and not as He was during the days of His flesh! It is evident that Paul the Apostle received revelation from the resurrected, ascended, and glorified Lord of Lords and King of Kings! The windows of heaven were opened to Paul and he was allowed to see and hear something that he said was not lawful for a man to speak. Could it be that what Paul saw in the third heaven was the same as what Isaiah, Daniel, Ezekiel and the Apostle John was allowed to see? What these men all saw in a vision was the Lord Jesus Christ, fully man and fully divine, sitting on His throne, high and lifted up and His train filling the entire temple. The Apostle Paul intimately knew Jesus the Messiah “As He Is,” and not as He was.10 Unlike the other twelve Apostles, Paul was the only Apostle called of the Lord who was not with Him during the days of His flesh. It was during the period of time when Saul persecuting the Lord’s people that he met the risen Christ on the road to Damascus. Paul had never known Jesus of Nazareth in the flesh. He only knew Christ “AS HE IS” in His risen, glorified, form and not as He was! Because of this relationship with the risen Christ, the Apostle Paul decided that nothing was going to hold him back. He was fully persuaded and determined to declare his cruel past over with, and become a new man in Christ. Paul changed and willing to suffer persecution for the sake of Christ, continued to press on toward the mark of the high calling of God in Christ Jesus. Paul had no doubt who Jesus is and knew that by remaining faithful that one day he would be crowned with the crown of righteousness by Jesus the risen, glorifid Christ. Paul who came from a background of Religious Jewish Traditions and keeping the Law had made a decision to count allof his family background and religious accomplishments but “dung.” He left it all behind once He saw Jesus for Who He Truly is today! We too can know Him AS HE IS today and press in to develop an intimate relationship and fellowship with the Lord Jesus and with the Father. Now and in Eternity Future He is and will be forever remaining fully man and fully divine. The Father has highly exalted Christ as the High Priest after the order of Melchizedek. After the gathering together of the saints Christ as King will take His rightful place setting up His kingdom government on earth and sitting upon His throne as Lord of Lords and Kings of Kings of the entire Universe. Lets us pray that God would assist us to see the Lord Jesus “AS HE IS” today, and that He will also allow us to move on to perfection, or spiritual maturity in order to obediently respond to our high calling of God in Christ Jesus. In eternity past Christ was the divine Sonof God, in the form of spirit with the Father. During the days of His flesh the Messiah chose to limit Himself by setting aside His Godly attributes, and was born of a virgin, fully man (flesh) with perfect sinless blood. Now and in eternity future Christ is and will be forever remain “As He Is” fully man and fully God. Christ has been highly exalted by the Father and serves in the Holy of Holies in heaven as the High Priest after the order of Melchizedek making intercession for the saints. Then after the gathering together of the saints when His role as His Priest is completed, Christ will then take His rightful place setting up His government sitting upon His throne in the Kingdom of God as Lord of Lords and Kings of Kings of the Universe. Lets us pray that God would assist us to see the Lord Jesus “AS HE IS” today and that He will also allow us to move on to perfection or spiritual maturity in order to obediently respond to our high calling of God in Christ Jesus. Is Jesus Christ – Fully Man and Fully God? These and many other examples may be found showing the full humanity of Jesus of Nazareth and how He did not come to do His own will but His Father’s. Like all men He experienced pain, sorrow, disappointment, loneliness, hunger, and the entire range of human emotions. In the garden of Gethsemane, His agony and temptation to find another way was so intense the capillaries broke in His forehead causing Him to sweat blood. Nevertheless in spite of all the temptations He overcame and said, “Not my will but thy will be done” giving glory to the Father Who had sent Him. Peter knew that Jesus was fully human, and he knew that there was no other man he had ever known like this Jesus of Nazareth. No one else had the words of life and did such wonderful mighty works as Christ was able to do. Let’s return to Acts 2:33 and see what Peter learned while he was preaching on the day of Pentecost. What a tremendous revelation and insight this is in observing how Jesus Christ became simultaneously both fully man and fully God! The Greek word for the word received in this verse is lambano which means to take, take hold of, apprehend, to take or receive from another; to take what is given; hence, receive, pointing to an objective reception. In Hebrews, the scripture declares that because the Son of God loved righteousness and hated iniquity that He would be anointed with the oil of joy or gladness above His fellows. When the Father anointed the resurrected and ascended Jesus of Nazareth with the oil of joy, it was without measure. At that precise moment, in the form of a resurrected glorified man, God the Father restored all of Christ’s divine attributes. All those attributes which the Son of God had willfully stripped Himself of were restored to Him. 2. Andrew Murray, The Holiest of All, page 77. Was Jesus Christ fully Human? Chapter two of Hebrews deals with the humanity of Jesus Christ, Who was made a little lower than the angels for the suffering of death to be crowned with glory and honor. This chapter begins with the first and firm warning to take heed to the things which we have heard, because at anytime they may drift away from us. The warning continues to not neglect so great salvation, which began to be spoken by the Lord, when in the days of His flesh, He went about preaching and teaching the things concerning the Kingdom of God. All the while, the Father also bearing witness with signs, and wonders, and with many miracles, and gifts of the Holy Ghost, according to His own will. Did you know there was more than once ascension of Jesus Christ into heaven? When we study the scriptures closely we learn that the Bible describes two ascensions of the Lord Jesus into heaven. The second and final ascension was from the Mount of Olives with the Apostles in attendance. The first was on the morning of His resurrection from the dead in the presence of Mary Magdalene. Notice this scripture does not state, “I will ascend” at some future time, but is plainly states, “I ascend unto my Father. . .” Had Mary held on to Jesus at this time, He would have been unclean and would not be able to perform His High Priestly duty of the atonement. At the moment of this encounter, Jesus was evidently on His way into heaven to perform His High priestlt duty of th Atonement. Imagine what it must have been like the first time Jesus ascended into heaven? All attention was riveted on Him as He appeared as High Priest after the order of Melchizedek to fulfill His priestly duty of the atonement. What an awesome moment it must have been as the hosts of heaven watched as Christ approached the Holy of Holies in Heaven. Just as the earthly High Priest perform his duty of sprinkling the blood of the sacrificial lamb on the Mercy seat on earth, Jesus Christ in His role of High Priest after the order of Melchizedek, was carrying His own precious blood into the Temple of heaven. The blood of the Lamb of God that takes away the sins of the world was sprinkled by Christ on the Mercy seat in heaven. At this most significant moment our redemption was complete. All the eyes of heaven were watching as The Son of the Living God entered into the Holy place to cleanse the sins of His followers with His own precious blood. The plan of salvation was complete as His pure precious blood was sprinkled on the Mercy seat. Redemption was complete and sealed for eternity! What joy and rejoicing must have filled heaven! After ascending into heaven and the sprinkling of His own blood on the Mercy seat was completed, He returned to Jerusalem and spent the next forty days with the disciples in His resurrected glorified body teaching them the things concerning the Kingdom of God.. During this time He showed Himself alive after His passion by many infallible proofs and speaking of the things pertaining to the Kingdom of God. Christ told them that they would receive power, after the Holy Ghost is come upon them, and that they would be witnesses unto Him both in Jerusalem, and in all Judea, and in Samaria, and unto the uttermost part of the earth. Then as the Apostles beheld Him, He was taken up, and a cloud received Him out of their sight. They obediently returned to Jerusalem and spent the next ten days with the other disciples with one accord, in prayer and supplication. God opened the windows of heaven and allowed the prophet Isaiah to see the Lord sitting upon a throne, high and lifted up, and his train filled the temple. 3	And one cried unto another, and said, Holy, holy, holy, is the LORD of hosts: the whole earth is full of his glory. 4	And the posts of the door moved at the voice of him that cried, and the house was filled with smoke. 7	And he laid it upon my mouth, and said, Lo, this hath touched thy lips; and thine iniquity is taken away, and thy sin purged. This was a revealed glimpse given to Isaiah of the Lord of Lords and King of Kings Jesus Christ AS HE IS now since His final ascension into heaven seated upon His throne, highly exalted. Isaiah was allowed to see what was to him Eternity Future. Who he saw was the Lord Jesus Christ sitting on His throne, high and lifted up, His train filling the temple, fully God and fully man! The prophet Daniel was also given visions in the night of this Holy place as recorded in Daniel 7:13-14. 11	Saying, I am Alpha and Omega, the first and the last: and, What thou seest, write in a book, and send it unto the seven churches which are in Asia; unto Ephesus, and unto Smyrna, and unto Pergamos, and unto Thyatira, and unto Sardis, and unto Philadelphia, and unto Laodicea. 13	And in the midst of the seven candlesticks one like unto the Son of man, clothed with a garment down to the foot, and girt about the paps with a golden girdle. 15	And his feet like unto fine brass, as if they burned in a furnace; and his voice as the sound of many waters. 16	And he had in his right hand seven stars: and out of his mouth went a sharp twoedged sword: and his countenance was as the sun shineth in his strength. 18	I am he that liveth, and was dead; and, behold, I am alive for evermore, Amen; and have the keys of hell and of death. A quote from Seiss’ Commentary on the Apocalypse PP14 on ” The Son of Man” is fitting. Throughout the scriptures can be found many other accounts which tell of the visions that were given of Jesus Christ AS HE IS after His final Ascension into heaven, which occurred 40 days after His resurrection from the dead. These men who received revelations and visions were permitted to glimpse into Eternity Future and see the form of the Lord as He would appear forever upon His Throne. These revelations served to instill in them and others, who would hear, or read their words, a faith, hope and love which at times is beyond description. All of these men were never the same as their committment increased once they clearly saw and understood these visions.